5 Things to Tell Your Friends and Family About Oil & Gas & Renewables – and a whole host of other assets Scotland has, but which No don’t want to speak about…. we’ve struck oil – and gas – is without doubt an amazing bonus. And the industry has a very positive future. According to David Cameron it’s the “jewel in the crown” of the UK economy (June 2013). Between now and September 2014 various organisations, at home and abroad, will publish and revise their forecasts about oil prices and production levels. They will go up as well as down. The self-proclaimed “Project Fear” will jump enthusiastically on any “bad” news – even if it means Alistair Darling cheerleading for George Osborne’s Office for Budget Responsibility, which he previously described as “part of the Conservative party”. But on any view of the bigger picture, the future of the oil & gas industry is a bright one. Good Morning Scotland, 28 March, 2013. 2. The No campaign has quite some brass neck. The Westminster track record here is appalling. Where has our oil wealth gone? If you’re going to exploit oil resources, you should at least have something to show for it. Countries and provinces around the globe which have struck oil – from Norway to New Mexico, the Emirates to East Timor – have built up wealth funds from the resulting revenues. These can serve as a buffer against revenue volatility and ensure that future generations also benefit from our good fortune. In contrast, UK oil revenues were wasted on supporting Mrs Thatcher’s agenda– one which was repeatedly rejected at the ballot box in Scotland. Analysis shows that even just investing 30% of oil revenues since 1980 would have established a fund of up to £140 billion. So having shamefully wasted our first 40 years how can they argue that we should trust Westminster with the next 40 years of oil and gas revenues? 3. No-one denies that oil and gas revenues go up and down but so do other revenue streams – it is perfectly normal to manage budgets: it’s what Treasury Departments are paid to do. For Project Fear the rise and fall in oil prices is something that Scotland is uniquely incapable of dealing with – whereas the UK can manage and every other oil producer can manage. The No camp want you to believe Scotland is “overly-reliant” on oil, but Norway is an instructive comparison. Looking over the last decade Norway has always relied on oil and gas for a bigger share of its total revenue than Scotland. 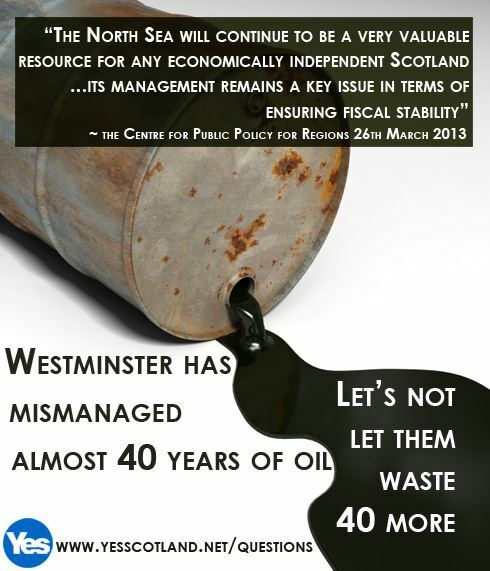 It has frequently been two or three times more reliant on oil than Scotland. Has it caused Norway problems? On the contrary. Norway is close to being the wealthiest country in the world in terms of GDP per head of population; it tops the UN Human Development Index on broader measures of prosperity; and has the largest sovereign wealth fund on the planet to help support government spending when times are tough – a fund now worth over £450 billion, or £90,000 per person! But the No campaign still thinks Westminster knows best. 4. But it’s daft or (in the case of Project Fear) deliberately misleading to talk as if oil and gas is all we’ve got in Scotland, or the centre-piece of the argument for Yes. As well as energy, Scotland has key strengths in sectors such as food and drink, life sciences and tourism. Scotland also has a world-class research base, with top-ranking universities, and a global reputation for science, engineering and creativity. And despite the recent challenges, the financial sector continues to perform well. The contribution of the people of Scotland to the UK economy (when measured as Gross Value Added per head of population) is 99% of the UK average – even without taking into account oil and gas. Scotland is lucky to have oil and gas – but has so much more going for it. In fact, it has more going for it than many of the small independent countries that outperform both Scotland and the whole of the UK in terms of prosperity, equality, fairness and human development. 5. We’ve struck oil and gas. And now we’re lucky to have struck gold again with our extraordinary renewable potential. In an age where energy security and global warming are two key issues, our country (with about 1% of the EU population) is blessed with up to 25% of Europe’s potential offshore wind and tidal energy and 10% of Europe’s wave potential. Little wonder the EU Commissioner for Energy Gunther Oettinger, has spoken of Scotland’s position as an “energy powerhouse of Europe”. Even here Project Fear is full of doom and gloom arguing that rUK might not buy our energy after independence, making it more expensive for consumers in Scotland. Yet that would make energy more expensive for consumers in rUK too, since they’d need to buy electricity from more expensive and less efficient sources. “We would highlight the fact that Scotland is the windiest part of Europe and as such has the potential to be the lowest cost supplier of renewable energy. We’re just waiting to hear what No have to say about our over-reliance on wind! We are fortunate to have resources like oil and gas……..but also celebrate our renewables, food and drink, tourism and hospitality, manufacturing, public services, life sciences, engineering, financial services………. Scotland’s got what it takes! Good, clear facts. This would make an excellent flyer/leaflet.